Eureka Premium: Vintage 1970’s Modern Murano Italian Art Glass Lamp Red with Gold Flake. 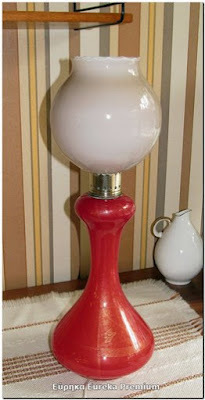 Vintage 1970’s Modern Murano Italian Art Glass Lamp Red with Gold Flake. For sale a vintage 1970’s modern Murano Italian art glass lamp. I don’t know the maker, maybe BAROVIER TOSO. The color is red and it has gold flake swirled in the glass. The lamp shade is opaline cased glass in brown smoke color with white inside. Both pieces it is in very good vintage condition with no chips or cracks, just normal age wear. The cord and switch both work correctly (European plug). Measures 48cm tall (18.9 inches). Please refer to the pictures for condition and feel free to email with any questions. The item will be mailed safely with delivery confirmation.